Making Childhood Dreams Come True…for all ages! Since 2006, Little Angels Pony And Pals( family owned) children’s entertainment and ‘hands-on’ educational services business. With 100% customer satisfaction and safety rate to-date, we are experienced at birthday parties, daycare and senior centers, church events, nativity scenes, private parties, mall promotions, parades, community carnivals and school festivals!! Our miniature horses, Quarter Horses and farm animals are handled daily, very gentle, and are an important part of our family. Western riding lessons are available for all ages at our farm. 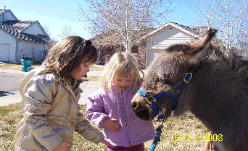 We specialize in bringing smiles and fun with animals to entertain everyone at your special event or on a visit to our farm. We take extra care to ensure a safe, enjoyable experience for everyone. We arrive early to set up and always clean up after our animals. We will work directly with you to determine which of our services will suit your needs and your budget. 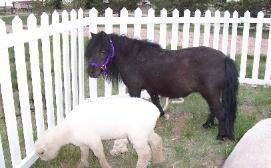 We take good care of our animals, they are all well-groomed, gentle and very healthy. Sign up now for our Enrichment program-we bring our animals to you at a price that anyone can afford! You can also come spend time at our farm with your kids! They’ll love seeing where all the animals live, petting them, beautiful Quarter Horses of all colors, taking a pony cart ride, swinging a rope like a cowboy, sitting on a little saddle or taking a horseback/pony ride. Check out our Visit Us page for information on pricing! Sponsor us to display your sign or banner in a parade on the back of our pony cart, at local fairs or farmer’s markets on the petting zoo fence-A Great way to get noticed! Call for more ideas for promoting your business name to customers.